This beautiful rainforest waterfall is all yours to enjoy! 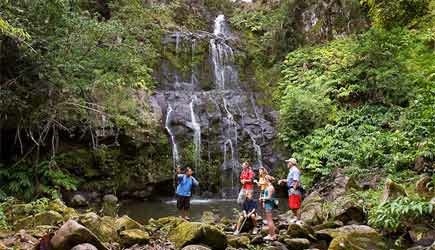 For an all-around Hawaiian adventure, join Hawaii Forest and Trail into the heart of the Kohala countryside for waterfall hiking. North Kohala is a land of old sugar plantations, Hawaiian legends, and untouched natural beauty. The excursion begins with a scenic drive through the Kohala countryside … upon arrival in Hawi town you will ride a 6 wheel drive Pinzgauer offroad to the trailhead. Walking along the 1.5 mile loop trail, you’ll pass two streams with seven waterfalls and three bridges, plus ancient Hawaiian terraces and flumes along the famous Kohala Ditch. With easy walking, countryside views, and a chance to cool off swimming in a mountain stream with cascading falls overhead, this is an ideal family adventure! Lunch is served during the tour, and on the way back a brief stop is made in Hawi town for you to check out the art galleries and quaint shops. Schedule: Daily at 7am from Hawaii Forest & Trail store in Kailua-Kona, and stops are made along the way at Waikoloa to pick up guests. Check In: Departure is from the Hawaii Forest and Trail Store, 73-5593 A Olowalu St., Kailua-Kona, HI 96740 Click to view map or the Waikoloa Queen’s Marketplace, 69-201 Waikoloa Beach Dr, Waikoloa, HI 96738 Click to view map. Restrictions: Guests should be able to hike on uneven or rocky terrain. What to Bring & Wear: Comfortable walking shoes or reef walkers, bathing suit, hat, sunscreen and a light jacket or sweatshirt. These Waterfall Hiking tours are not available for cruise ship passengers. We recommend doing one of the following tours to see waterfalls in Hawaii. Either the Secret Falls Kayak Tour on Kauai, a Helicopter Tour on Kauai, or the Road to Hana Tour on Maui. This tour is best described as a “walk” than a “hike.” The trails are not difficult and the total elevation gain over the course of the hike is about 200 feet. 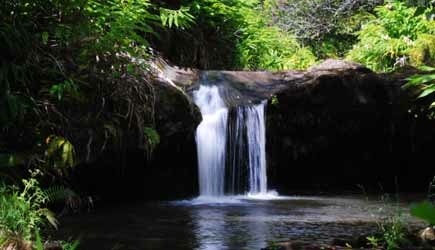 The Kohala Waterfalls Adventure is suitable for younger children and includes a swim at one of the falls. “Why do I need this tour? Can’t I just go to these waterfalls on my own?” The answer is no. Access to the trailhead is from private property and the road that leads there is gated and locked. While it would be possible to do the hike from the main road, you’d have to trespass in order to access the trail, and it would triple the amount of time it would take you to get to the falls. This tour now includes transportation from downtown Kona or pickup at Waikoloa Beach area resorts. Your email confirmation will detail the exact time and place where you will meet the tour company.